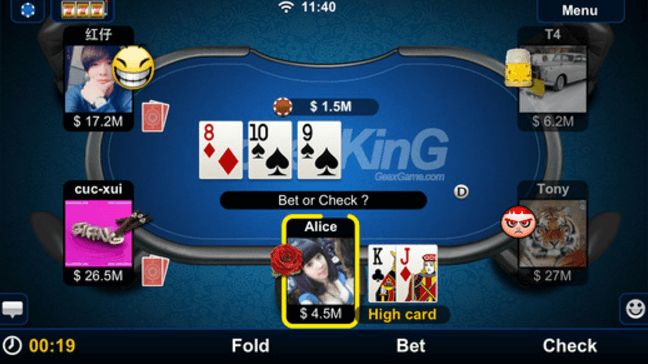 Texas Holdem Poker game app offers more than just conventional mobile poker gaming experience, as it contains real time and live social casino gaming by way of poker, slots, and blackjack games, all in multi-player format. Geax Game offers small, medium and big Texas Holdem Poker tables based on minimum and maximum betting limits; 5/10 for the smallest, around 200/400 for the medium tables and 5 Million/100 Million for the biggest. That way, poker players whether ranked as novices or experts, have a wide range of poker tables to choose from when using the Texas Holdem Poker app. In addition to the free stack of chips waiting for the new app user, every virtual poker room includes a classic 3-reel 777-slot game that could pose as extra source of chips to use as virtual betting money. This Geax Game app offers six multiplayer slot titles with progressive jackpot prizes at stake. All are readily available, with capacity to accommodate up to four (4) players all at the same time. Each slot game has its own minimum betting requirement, starting with one (1) chip, and progressing to 5, 10, 25, 50 and 100 chips per spin. The app also offers six multiplayer blackjack tables, with 5-player seating capacity, and presented in different casino themes: Atlantic City, Caribbean Cruise, Las Vegas Strip, Paris Lights, Monaco Mansion, and Dubai High Rise. Betting limits range from $10/$500 minimum and maximum bets, up to $100k to $5 Million minimum and maximum bets. Available to users of iPhones, iPads and iPod Touch devices running on iOS versions 7.0, Texas Holdem Poker multi-games social casino app by Geax Game can be downloaded free at the Apple iTunes App Store. To access the virtual lobby, app users must first create an account either as a guest user or as a Facebook-connected player. Geax Game offers additional $5,000 worth of chips to those signing up with their FB accounts and for inviting friends to install and play Texas Holdem Poker and other casino games. The app’s user interface serves as the virtual lobby where mobile device players can look for poker, slots and blackjack games. The poker table selections are presented as Holdem games, showing all types whether small, medium or big. App users will be able to view tables they can join by checking out the number of players currently seated at each table. Tapping on one’s choice opens the live gaming table where real time players could be engaged in an ongoing game. A player however must have enough chips to use as buy-in fee in order to secure a seat. Players looking to join a tournament can simply go to the Tournament section where they can select Sit & Go games based on Blind, Fee, and Top Prize at stake. A slider button can be used for increasing one’s SNG specifications. The app functionalities and control features are pretty much the same as those used as standard online poker room features. Buttons labeled with Raise, Fold, Hit, Split or Stand and for changing bet are all located at the bottom portion of the device screen. As a social casino games app, Geax added a chat messaging system that enables players to communicate with each other during an ongoing game. The lobby indicates if there are Texas Holdem app users belonging to one’s circle of FB friends. Players can also send virtual gifts to other players seated at the gaming table. The app’s setting options include changing the styles and color of the game table as well as the cards. In case a player prefers not to be interrupted by chat messages coming from other players or spectators, he or she can opt to Block All or Block Spectators only.